We have had a lot of requests to develop this type of item as it can be easily installed and hidden in nearly any cabinet. This IR Receiver works with all of our IR Repeater Systems. This unit is very similar to the national brands but at a fraction of the price. We have not personally tested with the National brands but you can compare the technical specifications and installations if you would like. 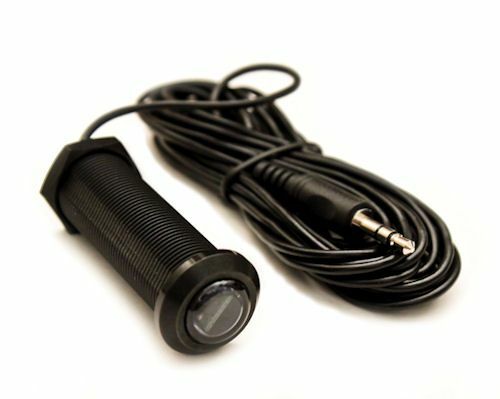 This product is designed and tested to work with the Hidden IR repeater systems that we sell. CFL friendly - allows installations in areas with compact fluorescent lighting. Works in most lighting environments. Wide band IR receives IR from many types of remotes. 10 ft. cable with 3.5mm stereo mini-plug. Please note that this ONLY works with our Deluxe IR repeater system. About Dual Frequency - This is only needed if you have a HD Cable or Satellite receiver that operates at a higher frequency then normally found. Over the last few years many new cable and satellite boxes from SA, DirecTV, Dish and Uverse have emerged operating at a higher IR frequency then before. Power - 12VDC, 30mA max. Its Easy - Just drill a 17mm hole ( 11/16 whole).